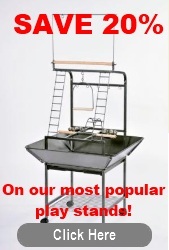 Flip Top Bird Cage | Open Top Bird Cages for Parrots. Flip top bird cages are great for birds who like to have some variety and perch up at the top of the cage. Just flip the top open and let your bird enjoy a perch with a view! Did you find a Flip Top Bird Cage to suit your needs? Exclusively focused on pet birds, our team prides themselves on finding answers. Here are 3 easy ways to reach them.